This is my second point about the phone. I once heard a sleep expert at Harvard say that texting at bedtime is a bad idea. The thought processes that you use to communicate are too stimulating to your brain, they make you more alert and can trigger a racing mind. Obviously, checking work emails (or any email) at bedtime is a really bad idea, especially if you come across something stressful. You may not even want to read the news, in case there’s a headline that stimulates thoughts or concerns. Notice what “winds you up” in the evenings. Either avoid it or schedule it much earlier. 5) Is there something specific you’re worried about? Learn a relaxation practice, such as a simple relaxation breathing meditation, to quiet your racing mind and relax your body before bed. If I can’t fall asleep, I focus on a three-line scripture about peace as I breathe slowly in and out, it almost always works. One of my coaching clients, a former figure skater, skates in her mind until she falls asleep. The sleep expert I mentioned earlier also said that if you struggle with insomnia, you should eliminate caffeine (and any other stimulants that could increase alertness) completely and see if that helps. If that feels impossible, start by eliminating caffeine in the late afternoon or evening. Sources of caffeine include coffee, non-herbal teas, chocolate and some supplements. Note: some people who can’t sleep or suffer from a racing mind have a bigger issue, such as Generalized Anxiety, Bipolar Disorder or other medical concerns. If your sleeplessness is extreme or doesn’t respond to simple interventions, it’s important to talk to your doctor about it. 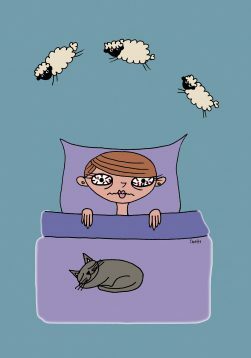 These are good tips for those who suffer mild insomnia. It is possible for a person who practices good “sleep hygiene” to still not be able to have quality sleep. For example, my boyfriend was in a serious car accident 13 years ago who tested negative for sleep apnea at UBC’s Sleep Disorder Clinic. As he has been on sleeping pills for a long time, none of the Melatonin supplements works. It’s very frustrating to explain his condition to even his own doctor and other health care professionals who think that he’s spending too much screen time or doesn’t have good sleep routines. He does! In fact, as soon as it hits 10 p.m., he will text me “Bedtime” and we’ll shut down our communication like clock work. I think he should be treated for PTSD but not one of the medical professionals even suggested it. Insomnia is a problem for many and some, unfortunately, find no relief, despite trying many things. Hi Lucy, thanks very much for your comment and yes, I absolutely agree. As I mentioned at the end of the article, if someone’s insomnia is severe and persistent and/or doesn’t respond to simple interventions like the ones that I mention, it’s important to seek medical care (I listed possible psychiatric causes, for example). Sleep hygiene is somewhat effective with insomnia but CBT-I is actually the most effective treatment for uncomplicated sleep issues, there are a few tips related to that in the list. I’m so sorry that your boyfriend hasn’t been able to get help with his struggles. Unfortunately I can’t give medical advice here (not that you’re asking!). BTW for people who struggle with sleep issues it’s a good idea to get off screens well before 10 pm, probably best to avoid them in the evenings period…but as you have stated it doesn’t seem to be the main contributor to his issues. Again, I’m so sorry for what he’s going through.